Weight machines are a good option for beginners. Beginning a gym routine can intimidate even the most motivated of people. Cardio, such as running on a treadmill or gliding on an elliptical, is fairly self-explanatory, but options for strength training are a bit more complicated. Lifting weights at least two times per week promotes muscle gain, weight control, improved bone health and an overall fitter appearance. However, determining which method – dumbbells, resistance bands, weight machines, barbells, kettlebells or others – to use can be tricky. Beginners should turn to weight machines for a safe and effective strength-training program. As a newbie, dumbbells or other free weights might seem like the more convenient or easier-to-use method of lifting weights. In many cases, that’s true; however, until you’re schooled in the ins and outs of strength-training, weight machines are your best bet. The machines isolate specific muscles, allowing them to be strengthened before progressing to free weights, which require extra muscle power. They also require the user to conform to proper form, reducing the risk of injury, and are often easier to use for beginners, thanks to the explanations typically present on the equipment. Whether you’re using the leg press to work the lower body, shoulder press for the upper body or captain’s chair for the abs, there are some basic strength-training guidelines to follow for a safe and effective workout. First, lift the appropriate amount of weight for your fitness level. If you struggle to complete a minimum of three sets of eight to 12 reps, knock the weight down 5 or 10 percent. However, if you can easily lift three or more sets of 12 to 15 reps, it’s time to boost that weight 10 percent. When lifting, use slow and controlled motions – don’t allow the weights to bang down on the release. According to Bodybuilding.com, slow, controlled movements activate both the slow- and fast-twitch muscle fibers and cause less tissue trauma. In many gyms, there are just one or two weight machines per specific muscle. Therefore, it’s considered poor form to hog a machine for an extended period of time. If you like to take significant rest breaks between sets, step aside to allow another person to use the machine while your muscles recover. Carry a towel with you and wipe off the machines after you use them, particularly if you’re prone to excessive sweating. Finally, keep the noise down – if your lifts require grunting or yelling to complete, you’re probably lifting too much, as well as distracting others in the gym. When it comes to strength-training, there are two options: Engage in a full-body workout routine at least twice a week, or split your routine into lower- and upper-body workouts done on alternating days. Whichever route you choose, give your muscles 24 to 48 hours to rest, repair and grow between weight sessions. During each full-body workout, target one machine that works each major muscle, including shoulders, arms, back, hips, abdominals, thighs and calves; in a split-body workout, aim for one to two machines for each muscle. “Fitness” magazine names machines such as the incline chest press, assisted chin-up machine, lateral raise machine, cable machine biceps curl, leg press, prone hamstring curl machine and cable machine standing leg lifts as some of the top weight-machine workout moves. If your goal is better health, perform at least one set of eight to 12 reps, according to Bodybuilding.com. If you are trying to gain muscle, do at least two sets of eight to 12 reps. Rest for at least 30 seconds, between each set, but get back on the machine within 90 seconds. 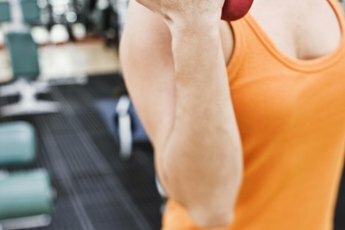 Bodybuilding.com: Best Beginner Weight-Training Guide With Easy-To-Follow Workout! Wayne State University Wellness Warriors: Free Weights or Machines? 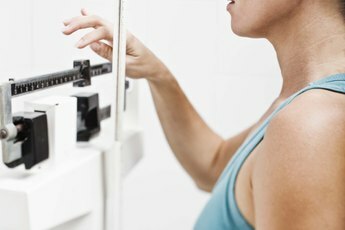 What Are Some Workouts for a Female to Lose Weight? 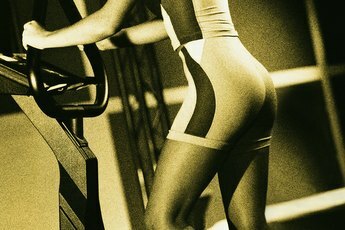 What Are the Benefits of Weight Machines?